On the blog today, we have delectable Butter Chicken recipe, extremely popular main course dish. It has gained world wide fame, and it is usually served with Lachcha Paratha or Nan. 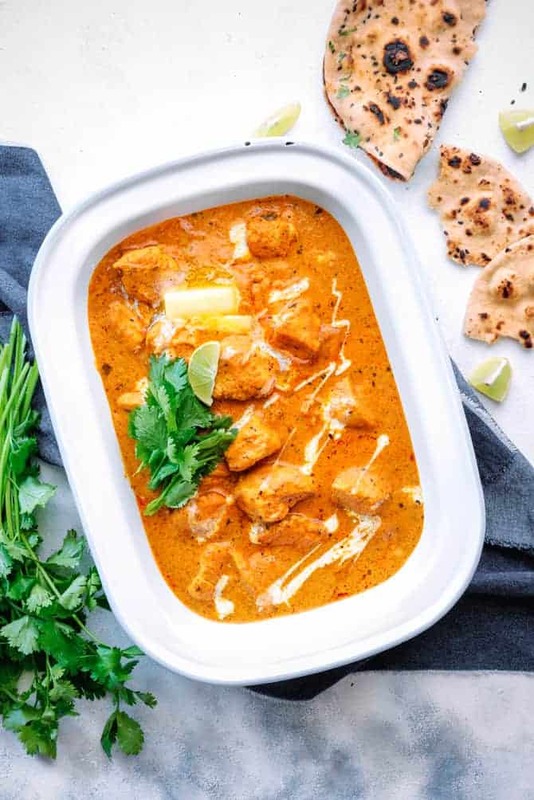 Butter Chicken or Chicken Tikka Masala are the two great dish, you will find on the top list when we Indians go to any restaurant to enjoy a meal with family or friends. Butter Chicken is a quintessential dish of Northern India, especially towards the Punjab region. How royal it looks, when Butter Chicken is served with loads of cream and butter on the top. Not to mention, but the richness to dish comes from butter, cream and nut. Obviously, the nut used in butter chicken is always cashew nuts, but we can replace it with almonds as well. Sometimes, I do use almonds instead, though it really does not compromise with the flavours of authentic Butter chicken, and it tastes equally good. So, at certain times we can use almonds too. Now, let’s see what are the ingredients we use to make this lip-smacking Butter Chicken. Ofcourse, chicken is the main component 😉 . We are using boneless chicken here, but, you can use chicken on bone as well. Below, in the recipe, you will see the list of components to make a powder, which we will use in marination. Prior to any thing, first we have to make the spice powder we will be using in marination. And, indeed you can make the spice powder in bulk to freeze. Store it in freezer, as it stays very well for good 3-4 months. In this case, please do not skip this step. Next, the marination time should ideally be 2 hours at least, however it is better if we do it for over night or so. Anyway, if you are short of time, you can go with an hour of chicken marination too. Do not skip the process of marination as it makes chicken succulent and tasty. Also, it soaks the aroma and flavours extemely well. Grill the chicken well on grilling pan basting it with butter on regular interval. Or, you can grill the chicken on tray in preheated oven at 170 for 30 minutes. Proceed with making of onion and tomato gravy, which has to be sauteéd in butter, add grilled chicken. Absolutely delicious Butter Chicken is ready. And, do not forget to dress up the butter chicken with tha splash of cream and blob of butter. The choice is all yours to serve it with accompaniments like Pulao or even zeera rice, apart from nan or lachcha paratha. In a bowl mix together ground powder and all the ingredients listed in the marination above. Cover and marinate it for an hour. Add almond paste, left marinade, cumin powder, turmeric powder, red chili powder, salt and sauté for another minute. Dish out, garnish with cream, blob of butter, and coriander leaves. This is a perfect butter chicken recipe. Always great to have authentic butter chicken! Thanks for the recipe! Thanks for sharing the recipe! It came out perfect!